Lottoland Review | 33 Lotteries, Free Promos, and Maybe a Scam? Even though I prefer lottery agents over lotto betting services—which Lottoland is—I was very impressed by what they offer. Yes, you won’t actually get to participate in the lottery games they offer here—at least not officially—but I found that not to be an issue at all. The fact that Lottoland offers a vast collection of games also more than make up for it. It's also 100% safe. Lottoland is licensed and regulated by two gambling commissions, which means payouts are guaranteed. And the best part? Lottoland credits winnings instantly to your account, and can deposit them directly to your bank. The only drawbacks? Limited payment methods and support options, but the positives here definitely outweigh the bad. Want to know more about what makes Lottoland a great service? Let’s dive right in. Lottoland is a lotto betting site that allows players to bet on the outcomes of official lottery games. They provide quick and guaranteed payouts, support for all of your favorite lotteries, and loads of other games and bonuses. And while Lottoland may not be our number one pick, it’s definitely set the bar as far as betting sites go. Plenty of games. You can spend hours on their website. Lottoland works by lotto betting, which is different from how most other lottery sites operate. Instead of having agents purchase tickets on your behalf, Lottoland lets you place bets on the the actual lottery results – specifically which numbers are drawn. This means you won’t be participating in the official lottery per se, but the experience is still very similar. You’ll still pick numbers the same way, and from the same pool as the official lottery you’re betting on. You can also place as many bets as you can afford. As for winning? Lottoland will match whatever amount you would’ve won had you actually played the lottery – including the jackpot, regardless of how large. Other lotto betting sites may have given the whole business model a bad rap – with confusing rules and much smaller prizes. You won’t find that with Lottoland. It’s as good as playing the official lottery, and in some cases, even better. Creating a free Lottoland account is pretty straightforward. Lottoland accepts players from around the world. But if you reside in one of the countries they don’t support, you won’t be able to join. This is usually for legal and/or tax reasons. Countries that aren’t supported will not be selectable when signing up. Click here to start betting with Lottoland. IMPORTANT NOTE: There are several country-specific Lottoland domains, including .co.uk and .com.au. These domains are specifically for the use of residents of those respective countries. If for example, you signed up on Lottoland Australia, and you are NOT from Australia, your winnings may not be honored. Be sure to check you are signing up for the appropriate service. Each player bet on Lottoland is passed on to EU Lotto, Ltd., which is licensed and regulated by the Gibraltar Gambling Commissioner and the UK Gambling Commission. Lottoland is based in Gibraltar and has paid a total of €110m to over 743,962 winners and counting since its inception. Read more on Lottoland’s Wiki page. Lottoland occasionally provides players with free (and fully valid) line bets and scratch cards. You can visit the official Lottoland website for more details. You can also search on Google and many third-party sites will provide free vouchers, promo codes, and discount codes which you can redeem at Lottoland. I highly recommend you take the extra bit of time to look around. Free bets, 2 for 1 bets, and all sorts of awesome freebies are readily available on plenty of the most popular voucher and coupon sites. Can I receive a Lottoland free ticket? You are in a country where online lottery betting is permitted. You are a new Lottoland customer. At the moment, Lottoland doesn’t have any other promotional offers. The official Lottoland promotions page is empty, but be sure to check it out every now and then for the occasional sweet deal. You can view the Lottoland promotions page here. As far as lotto betting sites go, Lottoland is one of the few with a vast game selection. Heck, they even offer more than some of the best lottery agent services out there. Lottoland currently offers 33 single play lottery games, ranging from popular ones (like US Powerball, Mega Millions, and Euromillions) to relatively obscure ones (like German Keno, Hong Kong MK 6 and KeNow). If you’re looking for game variety, this is a good place to start. (Update: 10/9/2018) – Lottoland is now offering players the chance to win Bitcoin via the Bitcoin Lotto! It’s a straightforward game that utilizes that oft-used 6/49 lotto matrix. That means you need to pick six numbers from a guess range of 1 to 49. To win the jackpot, you simply need to match all six numbers. 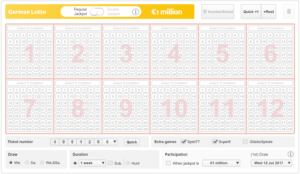 Jackpots start at 1000 BTC which is equal to €5.6M as of this writing. Lottoland also offers a decent variety of group play games. They currently offer a total of 17 options—all of which are different syndicate variants of games like Irish Lotto, Euromillions, Mega Millions, and Powerball. Lottoland also offers a wide array of online games, perfect for those looking for a bit more interactivity. If you’re looking for interactive games, Lottoland has the goods! 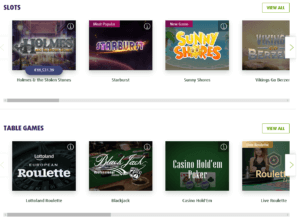 Currently they offer 25 virtual scratch cards, 22 instant win games, 126 video slots, 12 table games, 5 live dealer games, 3 video poker games, and some roulette games. As far as lottery sites go, that’s one of the most insane game selections around! If you’re looking for game types other than single/group play games, Lottoland has the goods. No, Lottoland is most definitely not a scam. A lot of the negative impressions regarding lotto betting sites are that winnings aren’t guaranteed, since you’re not actually participating in the official lottery. However, that’s something that won’t be a problem with Lottoland. While it’s true that you’ll only be betting on the draws, and not actually participate in the lottery, we here at Lottery Critic believe that Lottoland manages to replicate the same experience faithfully. That includes the assurance that in the case you do win, you’re guaranteed to receive a prize equal to that of the official lottery. In order to be licensed by these big names, Lottoland is required to provide proof that they have the financial capacity to pay out anyone who wins – regardless of the amount. In other words, all Lottoland players are assured that they will always receive their winnings in their full amount. Yes—Lottoland offers a safe and secure lottery site where you won’t have to worry about the money you deposit or any payouts to you. Not only does Lottoland utilize SSL encryption to secure data going to and from their site, payouts are also guaranteed. The bets you place on their website are made with EU Lotto Limited, which is regulated by the Gibraltar Gaming Commission and the UK Gambling Commission. They also hold a fixed odds license (RGL No. 066). Is Lottoland a real or fake company? Lottoland is a real company. They have offices in Gibraltar, Kuala Lumpur, Porto, and Sydney – with Gibraltar being home to their headquarters. Lottoland is privately owned. It was founded in 2013 by Nigel Birrell, who currently acts as the company CEO. How does Lottoland make money? Lottoland makes money primarily through sales of their main product, lotto bets. The company also sells other products like scratch cards, table and card games, plus more. A large portion of the money they make goes into their insurance policies – which is how they’re able to pay out huge jackpots like like those of Powerball and EuroMillions. Smaller wins come directly out of their revenues. Yes, Lottoland operations are completely legal. And as long as you are in a country that permits online lotto betting, then using it is legal for you as well. Does Lottery Critic trust Lottoland? Yes, Lottoland gets Lottery Critic’s seal of approval. Not only that, we’ll go ahead and say that as far as lottery sites go, Lottoland sets the gold standard for online lotto betting. When you win any of your lotto bets, Lottoland deposits all your winnings to your account, regardless of how much your prize is. That’s fantastic! They also don’t take commissions from winnings. That being said, if you win the jackpot for US Powerball or Mega Millions, it’s a different story. Lottoland claims that they aim to replicate how official payouts are handled with regards to these two lotteries, which means that they also take into account the tax that an official winner has to pay. In other words, a 35% reduction is made to your jackpot winnings. They don’t do this for other lotteries. When you win, your prizes automatically get credited to your Lottoland account. From there, you can transfer your winnings to bank account or card. Simply go to the My Transactions section of your Lottoland account and hit the Withdraw button. Currently, they only accept popular credit cards Visa and Mastercard, plus e-wallets like NETeller, Skrill, PaySafe and UKash. They also accept payment via bank transfers. If you do choose to deposit funds via bank transfer—and you deposit over £100—they will add a 3% bonus on top of it. In the event you win, your winnings will automatically be credited to your account. At which point, you have a two options to “withdraw” those funds: via bank card or directly into your bank account. Withdrawing winnings to your registered bank card is quite simple—choose how much you want to draw and click on the “Withdraw” button. Withdrawing winnings to your bank account is a bit more involved, however. You need to know information such as your Bank Identifier Code (BIC) and your International Bank Account number before being able to complete a transfer. Has anyone won on Lottoland? You bet! 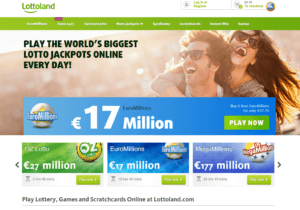 Lottoland has paid over €110 million to more 740,000 winners (and counting) since it first launched. Below are some of the biggest wins. A$808k: In November 2017, a 32-year-old mother of nine from Victoria, Australia won A$808,280.88 from a A$5 Quickie bet on MegaMillions. She got 5 numbers right and missed the Mega Ball. A$1.3M: Just six months before that, a 56-year-old grandmother from Melbourne, Australia took home more than a million Australian dollars from betting on the same lottery. Here’s an interesting tidbit. Did you know that the biggest ever online gambling win took place with Lottoland? That’s right. The record win is even recognized by the Guinness World Records. Christina, a 36-year-old former office cleaner from Berlin, was the sole winner of the €90,000,000 top prize on Friday’s (1st June 2018) EuroJackpot. She had placed the winning bet from the Lottoland mobile app, and it was only the second bet she’s made on Lottoland. Upon hearing the big news, Christina immediately quit her job, and now plans to travel the world and help out her mom. If you’d like to learn more about the biggest lottery winners of all time, you can read all about them here. Lottoland lets you play the lottery on the go, thanks to readily available iOS and Android apps. The Lottoland mobile app won Best Lotto App in June 2015 in the Gaming App Awards. As of this writing however, reviews aren’t very favorable. I personally haven’t had any issues with it. Another thing is that the app is no longer available on the Google Play store for Android devices. You can still download it as an direct APK from the Lottoland website, though. The iOS app is freely downloadable on the Apple App Store. The Lottoland website is also optimized to work for with mobile phones, so you’ll have no problem accessing your account or using any of the Lottoland services even if you decide to forego the app. You can reach Lottoland representatives by sending them a message through an online contact form or via live chat, when available. Chat hours are listed below, in CEST (UST+2). Lottoland does a pretty good job of explaining each lottery game they offer in detail. A very meaty Help & FAQ section is provided for each lottery game, which delves into topics like the game’s core mechanics, the various prize tiers, the odds, and more. Though Lottoland does not provide a lottery glossary like other sites do, I didn’t really miss it here just because of the wealth of information they already provide for each game. Lottoland’s website doesn’t stray far from the norm—it’s simple and an absolute breeze to use. If you’ve played in lottery sites before, Lottoland should immediately feel familiar. However, the thing that stood out the most was their focus on the games they offer. On their front page alone, you can get a quick glimpse of what kind of games they have. Not only do they put single play games front and center, they also feature some scratch cards, instant win games, and more. This makes it easy to gauge whether they carry the games that interest you the most or not. Lottoland offers an easy to use website that puts the games front and center. It’s worth noting, however, that while Lottoland offers their site in 10 languages, there are no Asian languages featured. They only offer two versions of English (standard and Canadian), two versions of Portuguese (standard and Brazilian), German, Slovak, Polish, Swedish, Czech and Swiss (German). It’s not a big deal—though of course it would have been ideal to make the site more user-friendly for eastern players. Lottoland provides the most pleasant lottery betting experience you’ll find online. I really liked how easy and convenient it is to play on Lottoland. With a single click, you can make Quick Pick bets to instantly load your shopping cart. It makes betting on multiple lotteries extremely efficient. If you prefer to choose your own number combinations, you’ll have to go through a few extra steps, but it’s still super easy. Just make sure to watch out for unique game modes like Double Jackpot and Number Shield. Lottoland does a great job at explaining their mechanics, so you won’t be running into any problems there. Lottoland’s play slip offers features that are unique to their service. Lottoland has a stadium named after them. Originally named Brookvale Oval, the stadium was officially renamed Lottoland in February 2017, after the owners participated in a renaming deal with the lotto betting company. The stadium is the primary sporting grounds used by the Manly Warringah Sea Eagles rugby league, and has an approximate seating capacity of 23,000. You can visit the stadium in Brookvale, New South Wales, Australia. Who is the Lottoland girl? That would be the lovely Lydia Pedrana. A recognized TV and radio personality from Dubbo. Lydia Pedrana became the face of Lottoland Down Under when the company launched in Australia during the later half of 2015. Final Thoughts – Should You Use Lottoland? Yes, Lottoland is one of the best lotto betting services around. While I do believe being able to actually participate in lottery games is better than simply betting on the outcome, I was left impressed by what Lottoland had to offer. As far as lottery sites go, they have one of the most impressive selections of games. I also liked the fact that they deposit all winnings—regardless of amount—to player accounts; no need to travel far or appear in person! Even better is they take player security seriously. While Lottoland could definitely use more payment methods and support options, the sheer amount of different games on offer make up for their shortcomings. That, and the fact that payouts are guaranteed. If you’re looking for more than just single play lottery games and you like the idea of betting on lottery outcomes, then definitely check Lottoland out! The laws have again changed in Australia. You may want to update this review with the changes to Lottoland’s site. Thanks for the heads up, Matt! We’ll put this in the docket. Hi, I heard that there was a problem with Lottoland in Slovakia. Do you have any updates about this issue? Thank you. Hey Richard, we haven’t picked up any official news about Lottoland issues in Slovakia. Could you give us more details so we can reach out to Lottoland and clarify? Thanks!